Ha-Gaon Ha-Rav Ovadiah Yosef ztz"l fulfilled what every true Torah scholar is obligated: Do not tremble before man. He said what he thought, without fear, and without worrying about the potential criticism. And he certainly did not fear losing public opinion points, and this is correct, since Torah scholars do not need to be guided by public opinion, on the contrary, public opinion needs to be guided by Torah scholars. Obviously, the gates always remained open to disagree with him, but everyone knew that he was not ruling based on interests or out of fear, but he said what he thought, and stood firm against any pressure. He utilized his great genius and incredible courage in order to save the Jewish People in two ways: Through leniency and through unity. Ha-Rav saved through leniency. In fact, Ha-Rav Ovadiah was courageous to rule leniently when possible, out of concern that being strict would lead to leniency, since an abundance of Chumrot causes one to be lenient in Torah Mitzvot, and certainly he would not make new decrees. He obviously was not always lenient, and was occasionally strict against all the other authorities, when he felt it necessarily. And when he saw it proper, he was lenient. However, he did not do so on his own, since in his humility he did not make ruling based on Chidushim and Pilpulim, but based on the majority of Poskim. He obviously knew well that sometimes there was a strict minority, which included a Posek equal to all of those who were lenient, but he took the responsibility upon his shoulders to permit. And Ha-Rav saved through unity. 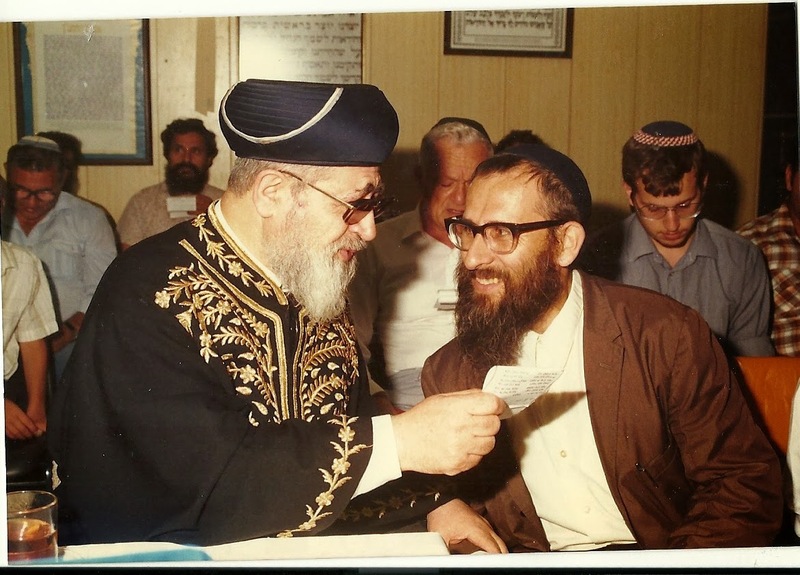 Ha-Rav Ovadiah courageously united all Sefardim, by giving up on local customs, and uniting around the Beit Yosef, "And Yosef was the leader over the land, he was the provider to all the people of the land" (Bereshit 42:6), both Ha-Rav Yosef Karo and Ha-Rav Ovadiah Yosef. Ha-Rav Ovadiah was not scared to decide in a halachic dispute since doubts and differences of opinion confuse and weaken. He therefore gave clear halachic rulings. And at the same time, even when not everyone agreed with him, he was strong as a flint-stone. And Ha-Rav Ovadiah was extremely successful in his mission. He raised up the Sefardic community, which was lacking both in Torah and societal status. He succeeded through his leadership, including unified halachic rulings, Divrei Torah, writing and establishing educational and political institutions. He is therefore justifiably called "Maran" – our Master – by Sefardim. Maran always worked hard. He already began to work at a young age, since he was from a poor family. And he continued to work hard his entire life in the field of Torah. His first work was writing comments on the margins of the book Reishit Chochma at the age of 9. And his entire life, he worked hard to elevate and refine his character traits. 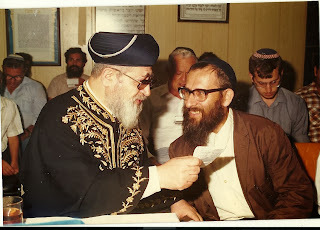 Forty years ago, Rav Ovadiah was attacked by ignoramuses in the press for a statement he made. They acted in their Chutzpa as if he did not know Torah. I wrote a short 10-line article to the newspaper pointing out a simple source for Maran's words. The next day I was called to the Kibbutz's only telephone, and I heard his gentle and soft voice: "Yashar Koach to the honorable one." Many years later, he called me, sat me close to him, and whispered to me in a fatherly tone: "Be careful, the honorable one, from those people, they worked against you." And one day in our yeshiva, a student told me that he had gotten engaged. "Mazel Tov! I am happy to hear!" I said. "There is one problem, however," he added. "She is Ethiopian and I am a Cohain" (some authorities say that Ethiopians must go through a "Giyur Le-Chumrah – a conversion for stricture" since some are question their Judaism. A Cohain may not marry a convert). "Why did you get yourself involved in a complication like that?" I asked. "I didn't think about it," he replied. "I appreciate her and I love her. I didn't notice her color." I sent him to a few different great Rabbis, whose opinions I knew, but they feared putting their rulings in writing. I then turned to Maran. The next say I received a letter permitting him to marry. "Take it," I said to him, "it is a piece of paper worth a billion dollars." He is truly a Rav who saved others. This giant is silent but his mighty, clear, courageous and upright spirit hovers above us, in the mouths of the giant Torah scholars and the simple people. This great saving hero testified about himself: I do not sleep at night bothered by how to have 10,000 other children recite Keriat Shema. May his soul be bound up with the bonds of the living with the souls of the greatest of Torah scholars.